Celebrating the spirit of inclusivity in sports and rec in Vancouver, we have been a proud charity partner of Our Cityride for the past two years. Set to be held this Saturday, August 18, the annual ride takes cyclists of all ages and abilities through a scenic route of Stanley Park and Downtown Vancouver. In anticipation of the mass ride, 365 International Sport Foundation and KLM Royal Dutch Airlines generously donated a pair of Norco bicycles to be presented to two lucky Canucks Autism Network (CAN) participants. In order to determine the recipients, we invited CAN families to share with us how our programs have helped their family become more active within their community. The overwhelming response of inspiring testimonials made for a difficult selection. But after careful deliberation, we are extremely excited to be presenting bicycles to two very deserving families. “With the support of CAN’s knowledgeable staff, our sons can participate in sports like any other child, but in a truly supportive, inclusive and caring environment. My oldest son has acquired so many skills through CAN swim that we were able to place him in regular public swim lessons for the first time this past spring! Now, we often go to our community pool and the beach to swim as a family! Meanwhile, Robert Weishuhn and his family of five have been CAN members for four years now. Together, they have participated in countless Family Events, including our annual Sports Day, YVR Accessibility Tour, Movie Matinee, and Teahouse Breakfast. At 15 years old, his son Jamie has enjoyed CAN’s Monthly Youth Program and will be going to Overnight Camp for the first time this summer at Keats. 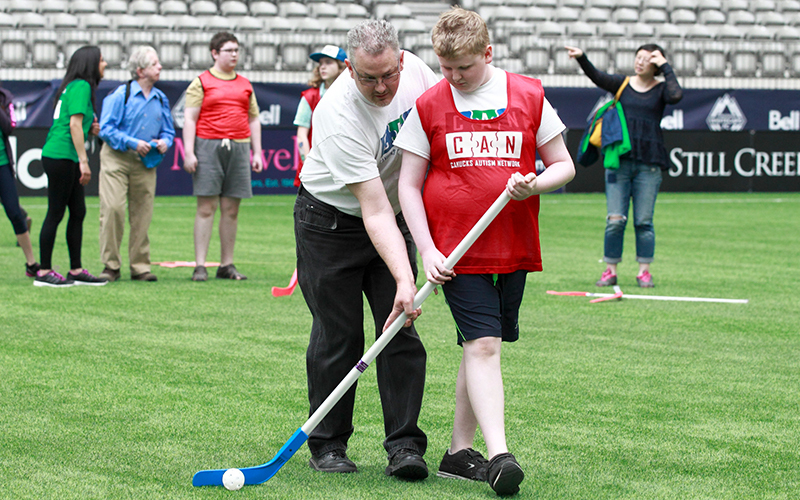 Robert and Jamie at CAN Sports Day in 2016. “CAN has provided us with opportunities to meet and make friends with so many other individuals and families living with autism. They have given us the chance to participate in activities that we would not normally be able to. *UPDATE! After two months with his new bike, Jamie is already riding in his neighbourhood! Watch here. With huge thanks to 365 International Sport Foundation, KLM Royal Dutch Airlines and Our Cityride, we are overjoyed to give both Susan and Robert’s family the opportunity to stay active in their community with their brand new Norco bikes. Both families will be on hand at Our Cityride this Saturday to receive their new rides. Join them at David Lam Park for a free family-friendly festival, featuring food, games and entertainment! And if you’re interested in participating in the ride, it’s not too late to sign up! Children and youth under 18 ride free, while adults can register for a low cost of $20. As a charity partner at @OurCityride Vancouver this Sat, we were overjoyed to see CAN participants Jamie & Kieran receive brand new Norco bikes! Thank you to 365ISF & @KLMCanada for this incredible donation.